Mr. Selby Wilson, Telecommunications Strategist, CTU, leads the interactive discussion on the elimination of roaming charges. Villa, St. Vincent and the Grenadines (28th March 2018) – The 3rd Caribbean ICT Collaboration Forum, held on 21st March, was convened to consider the Reports of the Collaboration Working Groups on Connectivity, Convergence and Consumer Issues. These areas are important elements for the CARICOM Single ICT Space, the enabling digital layer for the CARICOM Single Market and Economy, which would provide opportunities for innovation and entrepreneurship. 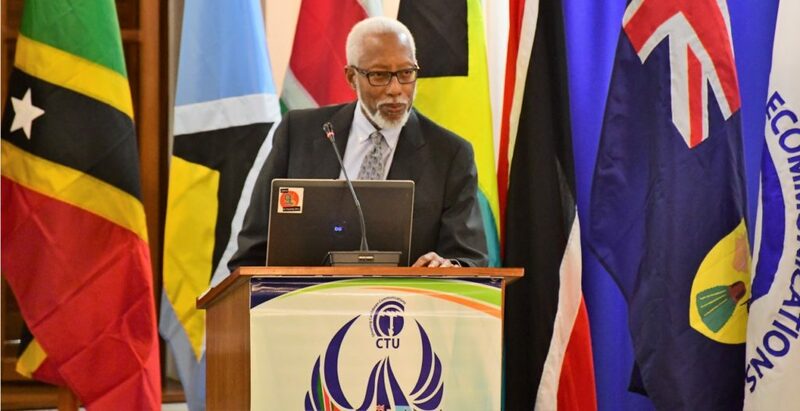 The Caribbean Telecommunications Union’s (CTU) Telecommunications Strategist, Mr. Selby Wilson, provided an overview of the objective of the Forum, noting that the Port of Spain Declaration on Collaboration for Caribbean ICT Development came out of the 2nd Collaboration Forum held in Port of Spain in December 2016. The Declaration includes a common vision for collaboration within the region to develop a common understanding of the mechanisms of collaboration and to promote its practice among governments and all stakeholders in the ICT sector. He further noted that the CARICOM Heads of Governments had identified policy directions based on the Vision and Roadmap for the Single ICT Space, which they had approved in February 2017. These included creating an environment more conducive to investment; having efficient e-Government services and servicing methods; and the elimination of roaming charges among CARICOM States. There was healthy discussion during the Forum, which provided useful points for consideration by the Collaboration Committee and its Working Groups. Participants were asked to further study the reports and provide any additional feedback to the Working Groups. To get the best out of the sector, the CTU is of the firm belief that there must be collaboration among all stakeholders. Various interest groups ranging from government officials with responsibility for ICT, regulators, network operators, civil society and consumers were represented at the Forum.